How Does Lead End up in Your Tap Water? We are getting calls from all over the U.S. since high levels of lead were found in the Flint Michigan water system. While most people know that lead can dangerous to our health, especially for infants and children, they don’t really know how lead can enter their water supply. This is true whether you water comes from a municipal water company or from your private well. This video, put out by USA Today, shows you how even water coming from a municipal water company where it has been treated can end up coming out of your household taps with elevated levels of lead. The first step you need to take is to have your drinking water tested for lead and other contaminants. If the test shows you have a problem with lead and/or any of the other contaminants, you now can look for ways to treat for those specific problems. When asked which of our informational water tests we recommend we normally suggest our ‘Bang-for-the-Buck’ Essential Indicators Water Test. It covers most of the parameters you need to know about when it comes to understanding just how safe and clean your water is. https://drinkingwaterspecialists.com/wp-content/uploads/2016/12/dws-with-girl-392x72.png 0 0 Mike Beek https://drinkingwaterspecialists.com/wp-content/uploads/2016/12/dws-with-girl-392x72.png Mike Beek2016-03-28 16:26:082016-05-19 08:56:55How Does Lead End up in Your Tap Water? 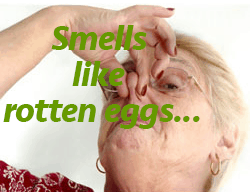 Has the well water coming out of your tap ever smelled like rotten eggs? If so, then you have slime-forming bacteria in your well water. Fortunately, it’s not a danger to your health. However, it forms a layer of slime on water pipes and other surfaces it passes across such as water filters. This reduces the useful life of the filters. It can corrode pipes, cause “rotten egg” odors, and turn the water black. This video tells you what you need to do to counteract these bacteria in your well. If you live in an older city with aging lead water pipes, you may have lead in your water. The water problems in Flint Michigan have brought out the fact that even if your water company is producing safe, clean water, the old lead pipes that carry the water to your home may be leaching that lead into your home. I’ve put up a video that address what you need to know if you do live in a city and want peace-of-mind that the water coming out of your tap is safe and clean to drink and cook with.